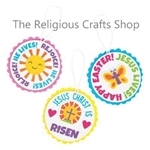 Pack of 12 Easter Hanging Crafts. A perfect craft project for Sunday Schools, this pack makes 12 hanging ornaments that children will love assembling. 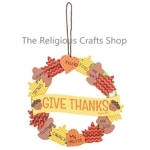 Use them to decorate the classroom or the church hall. Crafts are easy to make with self-adhesive foam pieces and satin cord for hanging.Approximate size when finished is 12cm. All craft kit pieces are pre-packaged for individual use. Kits include instructions. 1 Harvest Wreath Craft. A simple and special way to celebrate Harvest time and Autumn. All foam shapes are self adhesive - just peel and stick. Finished wreath measures 20cm and can be hung by the satin ribbon included. 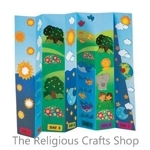 Christian Craft Pack - A collection of 5 different religious crafts. This is an ideal taster pack - an opportunity to try different crafts - or a great value gift for a child. 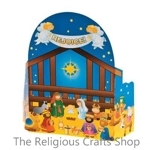 Each pack is a lucky dip selection of christian crafts. Contents may vary. Excellent Value - only �2.49. Christmas Variety Pack - a collection of 5 different Christmas crafts. This is an ideal chance to try out a range of Christmas crafts - or a great value gift for a child: they can enjoy making crafts leading up to Christmas. Each variety pack is a lucky dip collection of Christmas crafts. Contents may vary. Great Value Price - only �2.49. 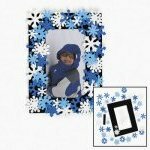 Christmas Snowflake Magnetic Frame Craft. A fabulous craft for children to make and sent to family and friends at Christmas. Easy and fun to make - ideal for children of all ages. Let them design their own special frame.Frame measures 16cm by 13cm with a photo space of 10cm by 6.5cm. Perfect as a special Christmas card or a special gift for a family member. 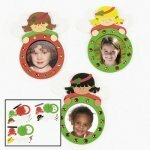 Christmas Craft Pack of Angel Frames. This is an easy and fun craft to make. Children will love to make these as gift for family and friends. Who could resist these cute Christmas frames? Finished crafts measures approximately 10cm with a space of 8cm for a photo. 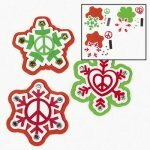 Christmas 12 Pack of Peace on Earth Crafts. These crafts are easy to make and children will love to take them home to display each Christmas - a lovely keepsake. Foam shapes and gems are all provided, just add glue. Finished craft measures approximately 11cm. 12 Pack of Trust in the Lord Foam Crafts. This craft is easy and fun to make - ideal for children of all ages. Also there is no mess as foam shapes are self adhesive, just peel and stick. Three different designs in each pack. Finished craft measures approximately 13cm by 10cm. Star Foam Frames plus Self Adhesive Foam Shapes. Fun and colourful foam frames with 6 sheets of self adhesive foam shapes (1 sheet of each design). Nearly 100 shapes to arrange and stick on a frame to decorate and personalise. Easy to make and lots of fun too! Frame measures approximately 19cm with the space for the photograph measuring 9cm. Octagonal Foam Frames plus Self Adhesive Foam Shapes. Fun and colourful foam frames with 6 sheets of self adhesive foam shapes (1 sheet of each design). Nearly 100 self adhesive shapes to arrange and stick on a frame to decorate and personalise. Easy to make and lots of fun too! Frame measures approximately 16cm by 13cm with the space for the photograph measuring 10cm by 7cm. Heart Foam Frames plus Self Adhesive Foam Shapes. Fun and colourful foam frames with 6 sheets of self adhesive foam shapes (1 sheet of each design). Nearly 100 shapes to arrange and stick on a frame to decorate and personalise. Easy to make and lots of fun too! Frame measures approximately 18cm with the space for the photograph measuring 10cm. 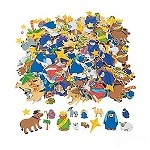 Pack of 50 Self Adhesive Nativity Foam Shapes. 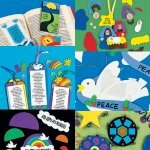 These packs are a Christmas essential for schools and Sunday Schools. Foam shapes are easy to use - peel and place in the chosen spot. There are a range of characters and designs. Great for making Christmas pictures and Christmas cards, allowing children to use their imagination. Shapes measure between 1 and 4 cm. Multi Pack of 50 Long Pipe Cleaners. 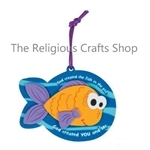 These are always an essential for Sunday Schools and schools, as they can be used for a range of crafts. 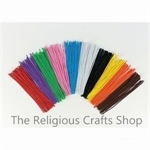 Each pack has 10 different coloured pipe cleaners, which are extra long length - 30cm long.